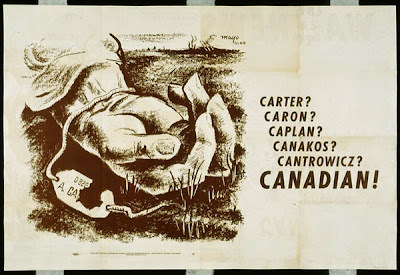 Figure 29: Poster illustrating that all war dead are Canadian citizens, 1944. When hostilities broke out in September 1939, the Canadian government sought early on to centralize and manage the stream of propaganda messages that would bombard the Canadian public. Indeed, government officials consulted old First World War posters and other materials housed at the Public Archives to determine the best means of influencing public opinion and morale. The Bureau of Public Information (BPI) and its successor, the Wartime Information Board (WIB), would coordinate the creation of war posters, working with designers, artists, and printers to create colourful, eye-catching works. Private companies and organizations such as the Red Cross sponsored some posters, as they had in the First World War. But this time, the federal government managed the production of a far greater range and number of propaganda posters than it did in the previous conflict, taking advantage of cheap offset lithography technology. The Second World War poster collection at LAC was started with contributions from the war government's departments and agencies heavily involved in the war effort. Beginning in December 1940 these groups, in particular the WIB, regularly transferred copies of posters to the Public Archives. In addition, a large number of items were likely sent to the Archives at war's end for preservation. Over the years, the collection has also been supplemented by donations from private individuals, including poster designers, such as Harry Mayerovitch. Mayerovitch designed this haunting image of a dead soldier clutching his dog tags. Although the viewer cannot make out the name on the piece of metal, the caption explained that no matter the background of the man, he was a Canadian. The Dominion government sought unity among Canadians and hoped that works such as this would reduce tension among ethnic groups.